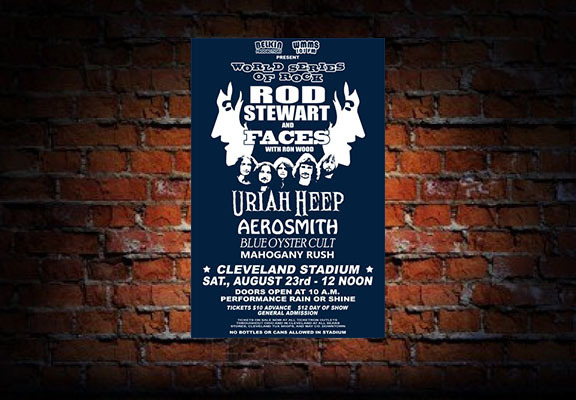 Rod Stewart and Faces headlined the festival series, The World Series Of Rock at the old Cleveland Municipal Stadium on August 23, 1975. Also on this amazing all day bill was Uriah Heep, Aerosmith, Blue Oyster Cult and Mahogany Rush. This entry was posted in Concerts and tagged 1975, Aerosmith, Blue Oyster Cult, Cleveland, concert, Faces, Mahogany Rush, Rock And Roll Hall Of Fame, Rod Stewart, Stadium, Uriah Heep.